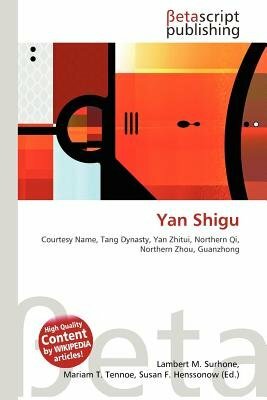 High Quality Content by WIKIPEDIA articles Yan Shigu but went by the courtesy name of Shigu, was a famous Chinese author and linguist of the Tang Dynasty. Yan was born in Wannian, his ancestry was originally from Langya. Yan's grandfather Yan Zhitui was an official under the Northern Qi, after the fall of Northern Qi, Zhitui became an official of the Northern Zhou, and moved his families to Guanzhong. His son Yan Silu, Yan's father, was also an official, and served under the residence of Li Shimin. Yan was well-read during his youth and was familiar in philology. He was recommended by Li Gang and was given a post at Anyang county (now Xiangfan, Hubei) during the reign of Emperor Wen of Sui. One of his father old friend, Xue Daoheng, was very impressed by Yan's talent, and often asked for his review on his new works. For some reason, he was deposed later and took a residence at Chang'an, during the next ten years he lived in a poverty life and participate in teaching career. He was later granted several important official posts during the Tang Dynasty. Yan was promoted when Li Shimin was ascended to the throne, but resumed his duty after his mother's funeral.